The butterfly bush is another easy plant for Texas, if you have the space for it. As you can see ours in the center of the photo, they can get quite large (that fence is six feet tall, and you can see the butterfly bush blooms from the other side). 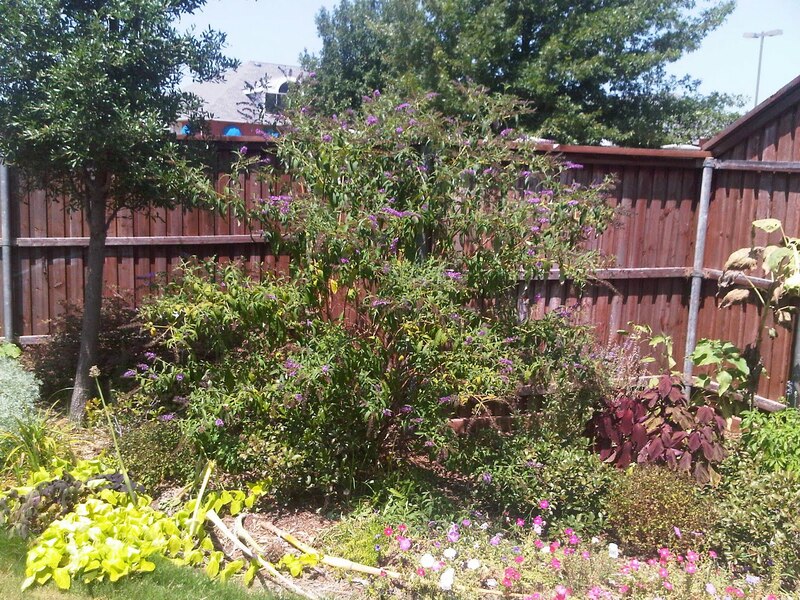 Since this photo was taken in late summer, the garden is looking a little ragged, but the butterfly bush still thrives through the heat. The other nice thing about the butterfly bush is that in addition to the long, cone-shaped flowers, it actually works and works well to attract all manner of butterflies to your garden, as its name implies. We have seen at least ten or twenty types of butterflies swarming the bush to get the sweet nectar. Also pretty amazing is that we bought this butterfly bush from Michigan Bulb, who shipped it in a very small pot, and by the next summer, it was already this size! The success and size of this plant has led me to think we may be adding a second one on the other side of the planting area to balance it out. Ours is a "Black Knight" which ended up quite a bit lighter purple than I thought it would, but it is still really attractive. Next on the list will be either a "Rainbow" or an "Empire Blue" which we may order in time to get this fall. We shall see! Maintenance note - you WILL have to chop this bush down in the winter. It gets HUGE! I take big pruning shears and cut it back by about half in mid-winter before new growth starts in the spring.